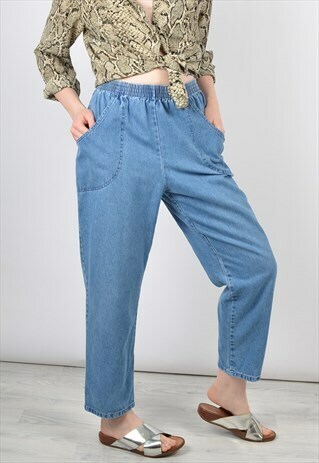 This Salvaged garment is a 100% vintage 1990s high waisted slouchy pants trousers with elasticated waistband, pockets and stitching detail. CONDITION - Excellent vintage condition, may be some natural signs of wear due to age. SIZE - Model is a size 8 and 5'6". Garment size UK 10-14. Waist 28"-32" 71cm-81cm / Inside Leg 25.5" 65cm / Hips 42" 107cm. DELIVERY - Next day delivery available Monday-Thursday on orders made before 1pm. Orders made on Friday will be posted on Monday. Model is a size 8 and 5'6". Garment size UK 10-14. Waist 28"-32" 71cm-81cm / Inside Leg 25.5" 65cm / Hips 42" 107cm.